There have been a few requests for Gretna Green cake toppers this year. Pictured here is one in white and one in purple so it can match the colour scheme. 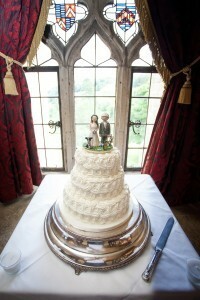 ‘Thank you so much for our beautiful cake topper of Gretna Green sign and the anvil. It went on top of our cake along with a Christmas spray and we had been married several days earlier and everyone thought they were coming to a pre-Christmas party! I think that is such a lovely story and a great surprise for friends and family. I have been sent some beautiful topper photos from customers this year and this is one of the most recent, there are more to see on the toppers on cakes page. It is always really appreciated when customers take the time to send photos to me, it is great to see them on the cake.